Nokia 3 is powered by 1.3GHz Quad-core MediaTek MT6737 64-bit Processor with Mali T720 MP1 GPU whereas Nokia 5 and Nokia 6 comes with 1.4GHz Octa-Core Qualcomm Snapdragon 430 processor with Adreno 505 GPU. 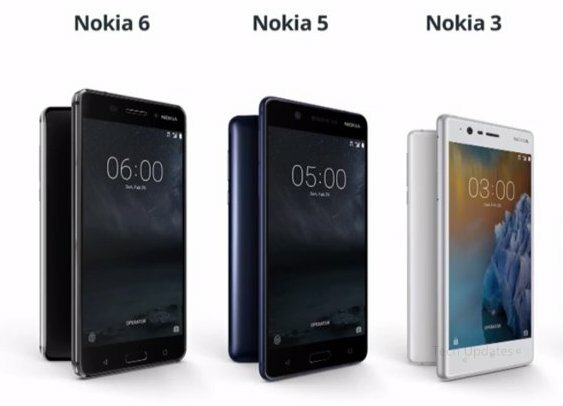 Nokia 3 and Nokia 5 comes with 2GB RAM and 16GB of internal storage.Nokia 6 comes in two variants one with 3GB RAM and 32GB storage, 4GB RAM with 64GB storage, all devices supports microSD card up to 128GB.Dual SIM devices run on Android Nougat which comes preloaded with Google assistant also all three phones will get monthly software updates. The device supports 4G LTE, WiFi 802.11 b/g/n, Bluetooth 4.0, GPS, 3.5mm audio jack, FM Radio. On Camera Nokia 3 has an 8MP Front and Rear Camera, Nokia 5 comes with 13MP Rear Camera and 8MP front camera coming to last Nokia 6 has 16MP Rear and 8MP front camera. Nokia 3 is packed with a 2650mAh Battery whereas Nokia 5 and Nokia 6 has 3000mAh Battery.